November 14, 2015. Karen Robinson spotted a pair of Balds, just north of Thorndale ..... Driving up a side-road to Cherry Grove, and a pair of Bald Eagles glide in front of car and land in field close to the road. I stop the car and take a good look. A very mature pair. I have seen eagles on many occasions, in my youth, as our farm near Wheatley Ontario had a nesting pair. This is the first time I have seen an eagle in this area, after travelling here bi weekly for the last 12 years. I again saw one of the eagles today 11/26/15, again landing in the field and then taking flight towards the Thames River. I am wondering why the eagles are now including this area in their hunting area and which pair they are? trying to fly out of a tree on our property but it crashed into some of the branches. When It tried to fly away it then hit more branches in another tree and fell to the ground. It was there for about 10 minutes. It was just seemed to be resting. It then flew up and away. On December 23rd 2015 Rosemary Corke from Grand Bend, Ontario, said .....While driving onto Grand Oaks, Southcott, I noticed something large moving in the woods. I slowed down and could see the white head and large beak of a huge bird of prey. It had just killed a black squirrel. I had never seen a Bald Eagle in this area before. Nina from Ajax wrote to say ..... I don't remember the date, but I know it was a Sunday, around 10 am. I was driving in north Ajax/Pickering and saw what looked like a Bald Eagle. I thought it was my imagination! I tried to watch as best I could, but the bird was flying south and I was driving north. What a great sight! 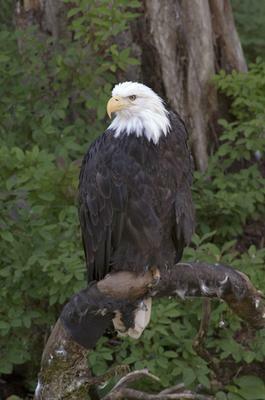 Angie Kotsos wrote to say ..... Driving west on 401, I saw a bald eagle sitting on a tree near the highway. Driving too fast to get a picture though. John Shannon from Shelburne reported ..... Traveling on Perth rd 163 on Dec 23, 2015 I spotted a bald eagle sitting on top of a tree it was amazing. I stopped and watched for about 5 minutes.